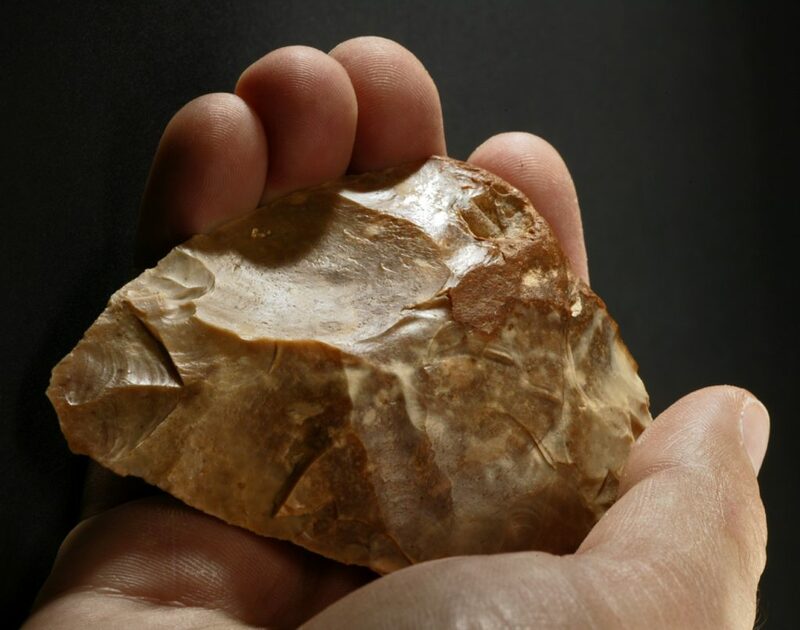 Handaxes are among the earliest tools made by humans, the oldest examples from Europe dating up to 900,000 years before present. They were multi-purpose implements, although undoubtedly a main use was for butchery to cut through the tough animal hide and sinew. Like all implements of this type the Blenheim Farm axe was shaped from a single piece of flint, its maker probably using an antler ‘hammer’ taking flakes from each face to make a razor-sharp cutting edge. The ‘cordiform’ (heart-shaped) axe is relatively small, measuring only 90mm in length and features some fine secondary working (retouch) to its edges. It probably dates to the Mousterian phase of the middle Palaeolithic, probably between 120, 000 and 30,000 years before present. In this period it is known that Moreton-in-Marsh marked the southern extent of a large freshwater lake which extended from Rugby in the east to Birmingham in the west and northwards to Leicester. This large body of water, referred to today as ‘Lake Harrison’ by geologists, would have attracted a range of large animals which might have included elephant and hippopotamus. Until the discovery of the Blenheim Farm axe, and of a second handaxe in the same area by CA archaeologists in 2010, evidence for human activity at the lake margins was very slight. The new finds are evidence that early humans were indeed present in this area and exploiting the rich food resource the lake and its visiting fauna would have provided.